I still have a lot to learn about posting, editing, formatting and technical issues with WordPress, but overall, I am thrilled with the look and the functionality I’ve gained by switching platforms. I was also glad to take the opportunity to “clean up” the mess that QueerJoe had become. Hopefully, you’ll like the new look and ease of reading through the blog. Please leave a comment with your thoughts (good, bad or indifferent). Also feel free to Subscribe to the blog with the link under my photo to the right. I am ALMOST finished with the Chalbi hat. I will most assuredly be finished by next blog entry…pom pom and all! I have started the decreases, so it’s only getting faster and faster until it’s finished. I like what you write. Have been following you for years. I think I first found you on MPB. Thanks Alan…writing the blog has always been a pleasure, and it’s always fantastic with people enjoy reading it. Have followed you for a long time and always enjoy your blog posts. Keep it up. Thank you Mary. 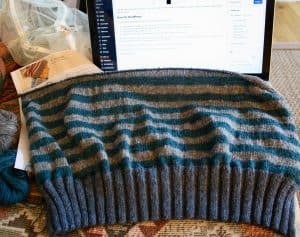 I can’t imagine not keeping the blog going…it’s been a great way of documenting my knitting and portions of my life as well. Thanks for being a part of it for so long. Exactly! It’s like living in our house for over 30 years…my sister mentioned how out-dated my kitchen was, and I was completely surprised since I hardly look at it from that perspective any more…and it wasn’t until I saw the new format of the blog that I realized just how bad the old one was. Thanks Judith. I have also enjoyed your blog for many years. Love the new look. Live in Yardley, hope to see you sometime at one of your craft events. My first Craft Show is this coming Sunday in Flemington…it’s an exceptional show and only one day, but the artisans are truly talented…I’m mediocre compared to most of them. Joe, I have been following your blog for years. Always informative and entertaining. Thank you and I hope the new format is what you have been looking for. Thanks Ron…nice to hear from you. This blog has provided a lot of avenues for expression for me, so I’m glad folks enjoy reading it…I’d probably write it even if they didn’t. Your old blog was very comforting in its familiarity, but the new one looks wonderful! Thank you for your blog, I look forward to your new posts each week.